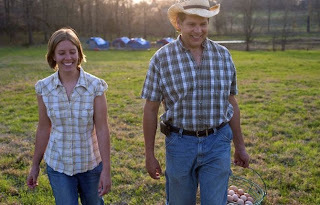 I've written several entries about Natures Harmony, and my skepticism about their "farm school" -- purporting to teach you how to make a profit farming -- and about issues related to their animal husbandry. Take a look at the reviews of Tim's book, "accidental farmers" to get a feel for the animal husbandry issues that I and many others, have had with Tim. Tim has spent quite a bit of money on his farm, and for someone who's going to teach you how to make a profit, it seems to be eluding him so far. So he's started a kickstarter project to raise $27,000 to help him expand his operation. Normally I'd be all for a farmer raising money to promote better welfare practices, or more local food, or to allow them to be of service to their local community -- all of those are great things. But Tim has chosen, many times, to make decisions which I and many others personally disagree with, and I'd hate to see this guy get funded doing the stuff he's done in the past. Tim, you've talked for years about "transparency" and "openness" and every time you've hit a rough spot you've deleted everything you can, removed the archives from google and any other search engines and that's pretty much the opposite of what you claim to support and you relentlessly ban anyone who asks questions or makes a comment about your operation. I have no idea how many people you've removed, but I've talked to quite a few over the years. Draw your own conclusions on why he deleted his blog, and his podcasts and most of the comments and information on his facebook page. When asked he claimed it was the hosting fees -- and didn't bother to respond to me when I offered to pay them in full. Do the right thing, Tim. Lets take farming to the next level, but with appropriate animal care and true transparency. 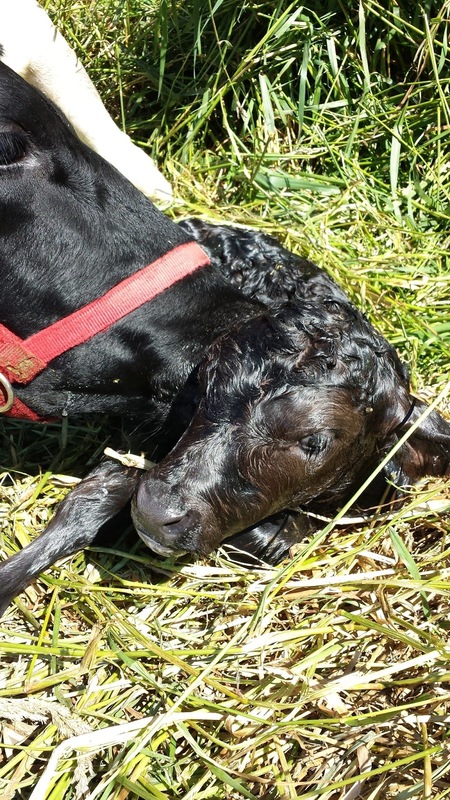 Milk cow project: The calf arrives! 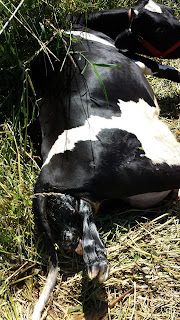 I've written a series of entries about my family milk cow. To go to the first entry in the series, click here. To see the previous entry, click here. How time flies. My Holstein heifer was due to give birth in July, and is a little earlier than I thought; a week or so early. I was out working on the water lines today and checked on her in the morning, but didn't see her. That's odd, I thought. 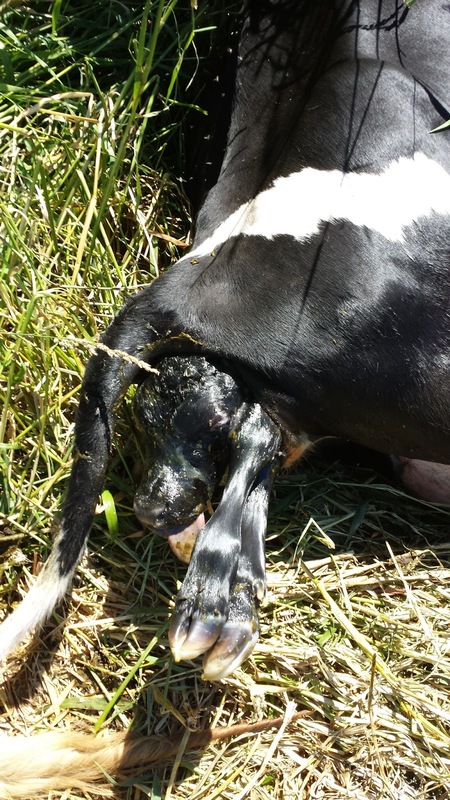 So I walked her paddock and found her on the far side, with just the feet of her calf sticking out. She looked a little uncomfortable, but the calf was oriented correctly, and so I went and got a 5 gallon bucket of water and some soap, and walked back to see how she was doing. She looked hot; I gave her the water, and she seemed grateful for it, and then I took a little bit and soaped up my hands and make sure that they were clean. I carefully explored around the head of the calf, and it was a tight fit. This is a big calf. 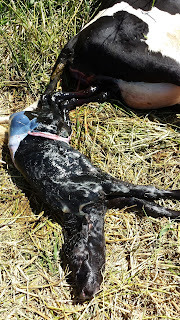 The cow was still straining, but making little or no progress, so I grabbed the front feet of the calf and applied gentle traction... well, sort of. I put my feet against her rear legs and pulled a bit. A little movement, a little bit of wiggling. Some more movement. 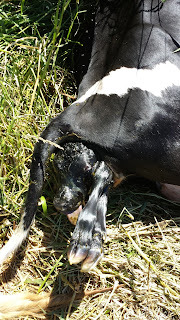 I was worried that the calf was distressed; I could see its tongue (you can see it in the picture above) and it looked a little purple. 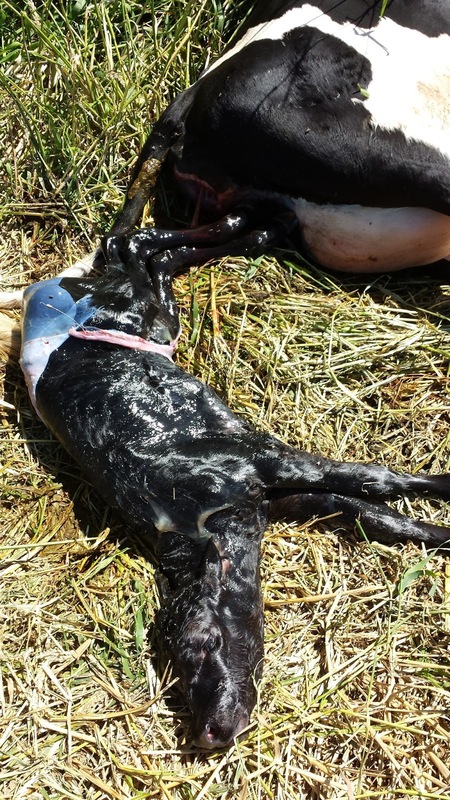 a giant calf is born. I cleared the mouth and nostrils, and then let nature take its course. a giant, rough tongue gently applied. 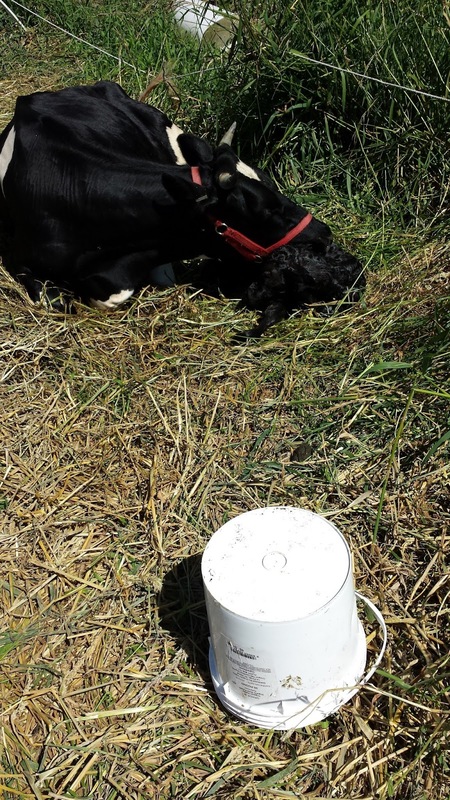 A little bit of soft mooing by the cow, an answering squeak by the calk. Everyone is good. 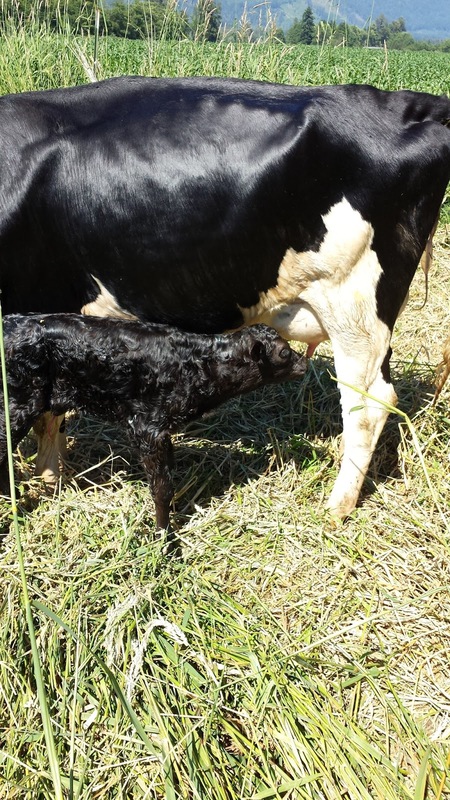 15 minutes later, the calf stood for its first milk meal. Cow and calf are doing great. What happens from here? I'll leave the calf on the cow for the next day to make sure that it gets several meals of colostorum. As with the other cow, I will share-milk this cow with her calf; the calf gets a couple of gallons a day, we get a couple of gallons. The calf here is a little girl. She's half Holstein, half angus. I am using a milking machine to milk the jersey, which means that the total time for milking, including cleanup, is about 10 minutes. It takes longer to bring the cow to the milking parlor. I'll write up a longer entry about milking by machine vs milking by hand soon. I'm looking forward to having both jersey and Holstein milk available to compare the two. They'll be eating the same diet and kept side-by-side, so the breed differences will be the only thing that makes a difference in the milk. Holsteins are a favorite cow for the US dairy industry because they produce a very large volume of milk per cow. Jerseys, a smaller cow, produce a smaller volume, but it's higher in butterfat - a richer milk. Had a litter of Airedale puppies. They are super cute. We have 12 of them; here's some pics in the barn. Enjoy!